The Biosurface Peel is a professional chemical peel designed to resurface the skin with minimal recovery time. A unique, multi-phase approach works with your skins biology to safely slough away dull epidermal layers and accelerate cell renewal without inflammation and prolonged downtime typically associated with chemical peels. What can the Biosurface Peel do? There are four steps within the treatment. This process finishes with a Decelerator. What this does is it decreases the activity of the acids and stops the exfoliation process, normalising the epidermis. This is very important as it means there will be no down time after this peel (a common issue with other peels). Your skin condition, skin concern and dedication to post-treatment care will impact the frequency and results of BioSurface Peel treatments. Clients typically notice dramatically improved skin quality, texture and tone within three treatments. Ideally, a series of three treatments are performed over a six- to twelve-week period, followed by maintenance treatments twice a year. Immediately after your BioActive Peel treatment, your skin may appear red and flushed. As your skin goes through the renewal process, it is normal to experience dryness, redness and tightness, as well as potential peeling or flaking within a week. You may also notice a more pronounced appearance of pigmentation as it rises to the skin’s surface. These side effects will subside quickly with proper post-treatment care, starting with the BioSurface Peel After Care Kit. At least 24 hours before your appointment You will need to come to the salon to have a patch test. 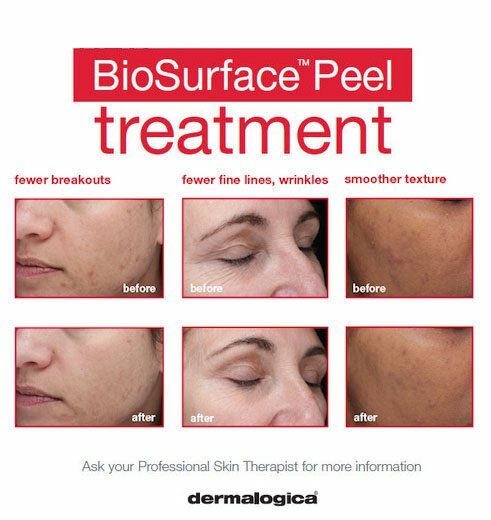 We have a Special Launch Offer on for Biosurface Peeling Treatments for January. The normal Biosurface Peeling price is £65, but our Launch price is only £50. This includes a FREE aftercare kit worth £20! That gives you an overall discount of £35. Photos can be taken before, during and after treatments so you can see the progress of your course.